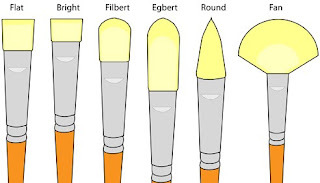 There are plenty of choices out there when it comes to buying new brushes for oil painting. 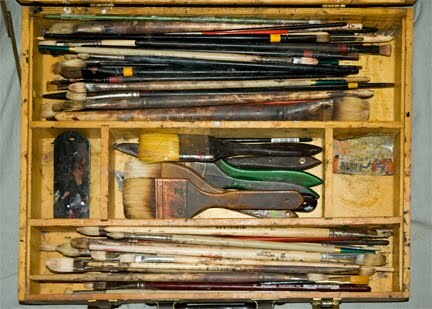 At an art store you will find rows and rows of different styles and shapes of brushes made from different materials. 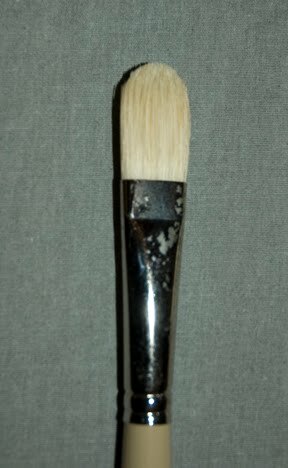 Each brush has its own purpose or is designed to be used with a particular medium. Some brushes can be really expensive and some can cost very little. 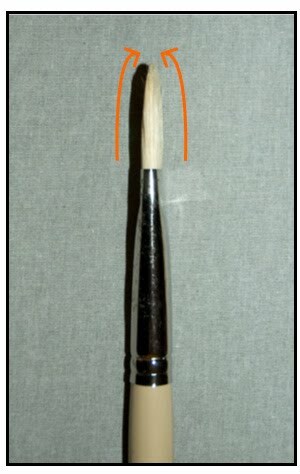 Brushes are made from different types of animal hair, synthetic materials, or a blend between the two. Today I am going to focus on the natural bristle brushes used for oil painting. These brushes are made from hogs hair and they come in a variety of shapes and sizes. To the left you will see a sample of some of the more common shapes these brushes come in, each has its advantages and disadvantages. Some are designed for very specific purposes but all are flexible enough to be used in a variety of ways. Most of the time, it comes down to personal preference as to the types of brushes you decide to use. Once you decide on the type of brushes the question is how can you tell which brush is a good brush and which is not. Expensive bristle brushes can be of really good quality, but price is not always the best indicator of a good brush, I like several of the less expensive brushes because they work well and save me money. In order to determine if you are purchasing a good brush you must be able to handle the brush and feel the bristles. The hogs hair on a bristle brush is a course hair and should have some stiffness yet bend under some pressure. A good brush is a brush that has interlocking bristles. That is to say the manufactures picked quality hair that curves just slightly. Then the manufactures takes advantage of this slight curve and as they assemble the brush they face the curves inward towards each other from the opposite sides of the brush. This gives the brush a sturdy clean edge naturally, which is what you want. You can see the bristles interlock when looking at the brush at the narrow side of a flat brush. One thing to watch out for is some manufactures will put a medium over the bristles to glue them together so that it makes the brush look sharp and crisp. Avoid a brush that has to much of this, in may be hiding a flaw. 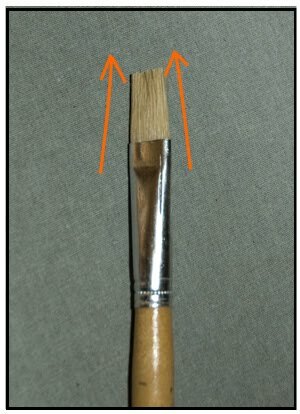 Notice in the picture to the left, the bristles in this brush are basically glued together. It looks sharp and straight but you don't want that brush. Because as you see to the right, once you wash the goo out of the brush it is possible you will end up with a brush where the bristles fray out. It is hard to paint with accuracy if the brush is frayed. A good brush doesn't need anything coated on it to hold its shape. That is because the manufacture took the time to select the right hair and took advantage of the natural properties of the hair. However, most companies these days put something on the brush before delivery to the store so don't go avoiding all brushes with something binding the bristles together. 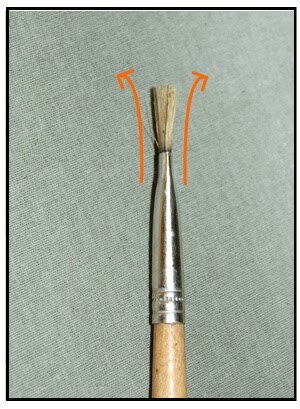 Just run you fingers through the brush and if the bristles separate easily and still hold their shape, its likely you have a good brush, just check to see if the bristles are interlocking. If you can not separate the bristles when you run you fingers though them, it is possible a flaw is being hidden, just put it back. There is much more to bristle brushes, including different qualities of hair, bleached versus unbleached bristles, and the styles of handles. This post should give you a good start when looking to purchase brushes. I also recommend looking online at what is available, you will get a good sense of the variety that is out there and learn a little more about brushes.